Very Good. A guide to the standard object modelling language, UML, this text provides programmers with the information needed to get up to speed. Trade paperback (US). Glued binding. 196 p. Contains: Illustrations. Addison-Wesley Object Technology (Paperback). Dispatched, from the UK, within 48 hours of ordering. This book is in good condition but will show signs of previous ownership. Please expect some creasing to the spine and/or minor damage to the cover. Damaged cover. The cover of is slightly damaged for instance a torn or bent corner. Inscription on the first page, typically just a name but may include a dedication or a brief personal message. "UML Distilled" is an excellent summary and quick reference for those who want to begin learning how to use the UML to model software systems, as well as those who have the need to use the UML occasionally but need to refresh their memory of the specifics of the UML. 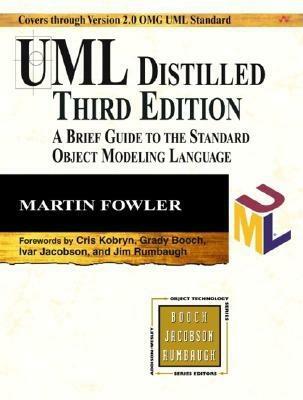 For those new to the UML, it is a quick read and can be used to get up to speed. You can use it to immediately start creating models. The book contains summaries of all of the important model forms and tips on how to use them. Highly recommended.